Week 21 - Doodled Edge/Border - Happy Birthday! Happy Birthday to Us!! WOOHOO! 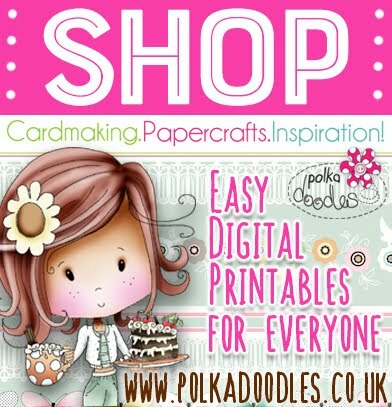 Yes, it's our 3rd birthday this week here at Polkadoodles - oh my, where has the time gone? We're all very proud indeed that some of our original teamies are still with us creating inspiring makes for us all each week, and I have to say a special huge thanks to Enfys, Ruth and Lou for putting up with me for three whole years, you girls rock! (You do too Nikky!!) Of course, I love the WHOLE of my awesome Design Team and they are all uber talented as you all know only too well, so I'd also like to say a big thanks to everyone else on the team wherever they may be in the world for their help in making Polkadoodles and this challenge blog one of THE most inspirational on the planet! Congratulations! please email Nikky for your prize and grab your blinkies from the sidebar of the blog - the first placed winner receives a download bundle choc full of goodies! Please put in the subject field of your email your placing and the challenge number. 3. Please link your blog post and not your blog address with Mister Linky - this saves us from searching your blog for your entry. It's my (Claire P) turn to host the challenge this week and as I do so love my doodling. Please include a doodled border or element in your project. As it's our birthday we're adding an extra element to our challenge - this has to be a Birthday Card or project for us! Don't forget you have all that candy to win!! Emma - Hello there, just joining Team A again for the lovely doodled edge challenge. I have used elements from the Sugar Plum Daisy CDROM again...... I just can't stop using this CD, I luuuuurve it so!!!! This little Bee is the BUZZ is he not? I failed on the stashbox stamp element but hey, when I have such a cute little fella like this to craft with, I forgot all about my other stamps. Anne - I've used papers from the second edition of the Pen and Paper Circle mag and the little sentiment ticket is from the Pretty Tuff CD. Lucy: This week I decided to go for some lovely bright colours. 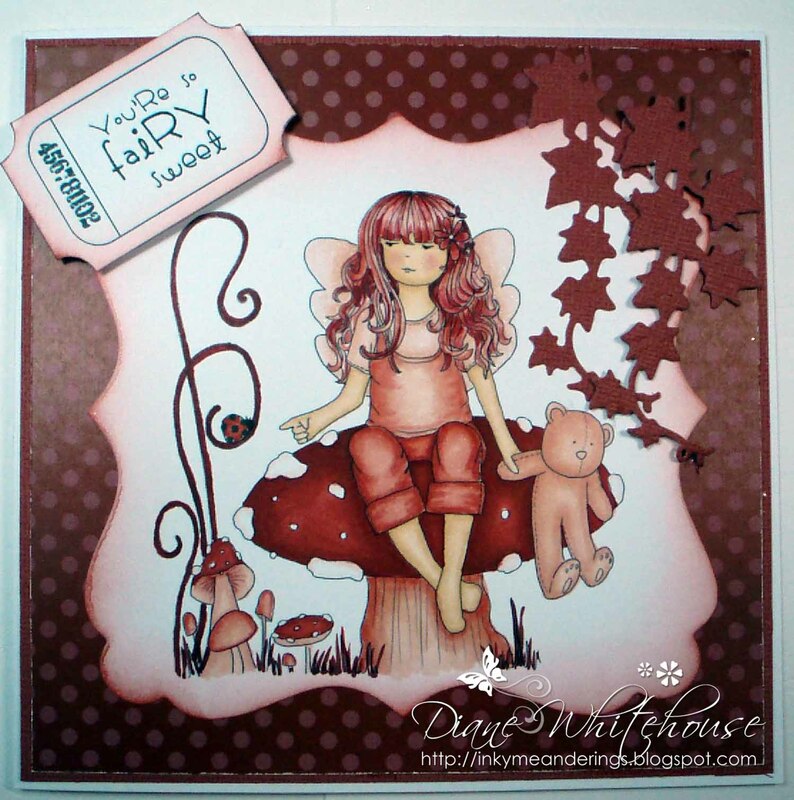 I used the backing papers from the Sugar Plum Daisy CD Rom and used matching Pro Markers & Flexi Markers to colour in the digi image. I doodled around the edge with a glue pen and then covered in glitter! Caire P - Since it's my challenge this week I really had to join in with team A (I have recently moved over to B) I have used papers from a free Polka doodles set that came with a crafting magazine recently. Main image from Sundae of Seasons cd, fab fun ladybugs from Sugarplum Daisy cd as is the sentiment tag. With that all important finishing touch, a tad of doodling! Lisa - 'The Crafting Owl'. Oooh as soon as I saw this challenge I knew it was right up my street! 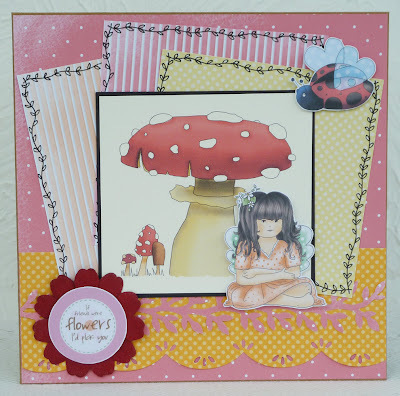 I've used an image from Sugar Plum Daisy and backing papers from Sundae of Seasons. Doreen: I've used an image from Sugar Plum Daisy and the backing papers is from Sundae of Seasons and Sugar Plum Daisy. I love to mix the paper. Fliss: I've used images from the Sugarplum Daisy CD and papers are a mix from there and the Pretty Sweet CD. My doodling was inspired by the leafy Martha Stewart punched border and I did a lot of layering for the final design of my creation. Daniele, for my card I have used the sweet mouse image from The Sugar Plum Daisy Cd coloured in with Prisma pencils, I have doodled lines around the embossed background to create a frame. Miria I made a quick easel card for a boy's birthday. I used coloured stampies, paper and sentiment from cd Pretty Tuff. Easy peasy! So there's your inspiration - some fantastic projects from the DT this week I think you'll agree! You have until Sunday 3 June at 12 noon GMT to enter the challenge, so just add your URL to the Linky below! Good Luck! 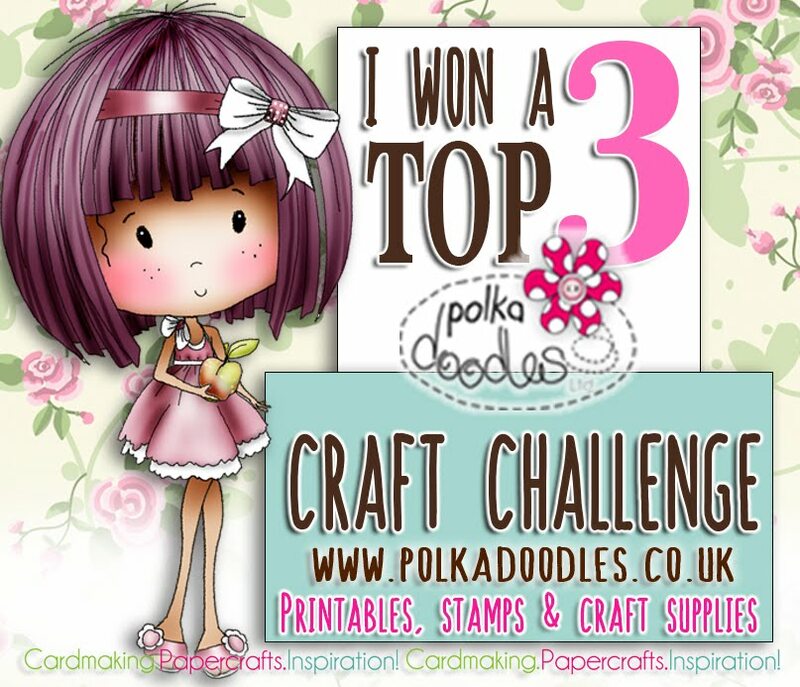 Yes, today is our 3rd Birthday - 3 years ago today we launched the Polkadoodles challenge blog and we've been bringing you some awesome inspiration from our amazing Design Team ever since!! So to celebrate this fabulous occasion we're having a BIG celebration and you can win over £220 worth of blog candy - so make sure you enter today's EXTRA challenge to be in with a chance to get some wonderful candy! woooohoooo!! We want to take the opportunity to thank each and every one of you who regularly enter our challenges from all across the globe for all your fabulous support over the past 3 years, here's raising a glass to another 3 and beyond! **important** when you add your challenge entry, please include your name and your Country so we can see it in the thumbnails, ie Nikky, UK - this will make it a whole lot easier for us to see where you guys are coming from, thanks! 1. Please follow the challenge! 2. Only enter your creation into a maximum of 10 challenges including Polka Doodles. 3. Please link your blog post and not your blog address with the blue frog - this saves us from searching your blog for your entry. 4. And please no back-linking to previous posts - these will be disregarded from our top three voting. Shary - What's better for a birthday than a lovely cupcake? 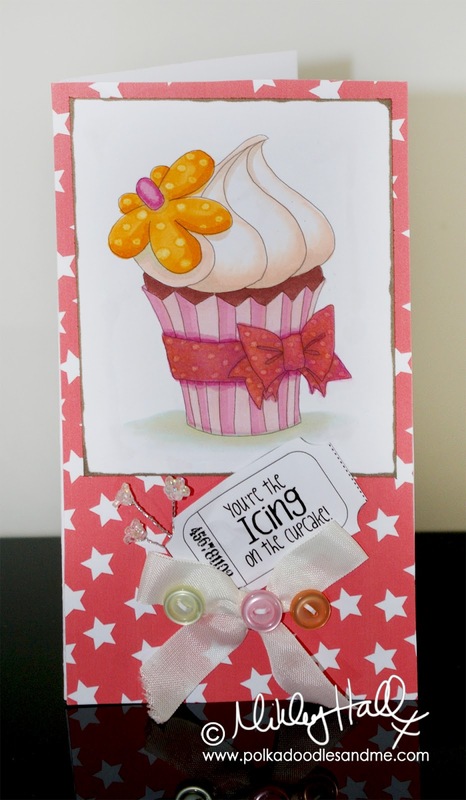 I have used a template from the Candy Doodles CD for a cupcake! 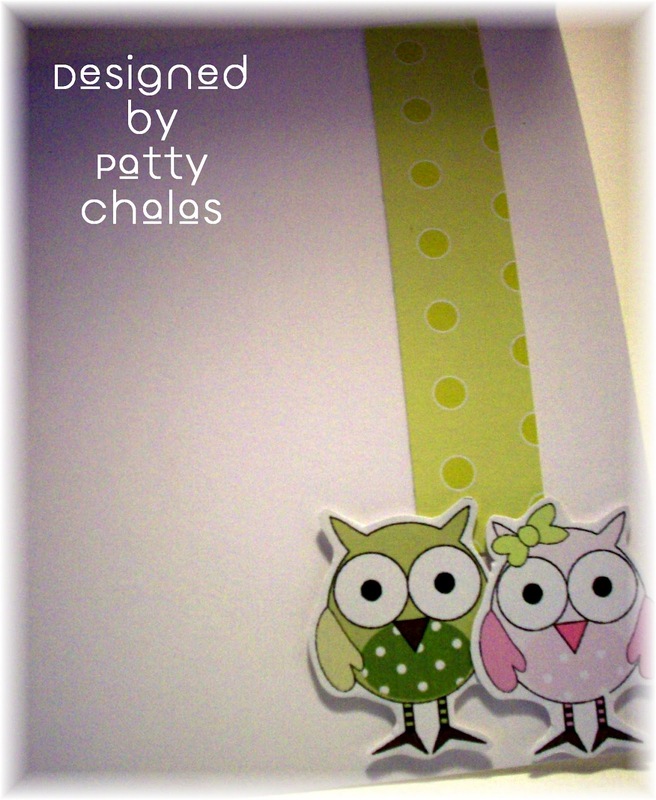 The templates are so easy to use, you get the templates, papers and embellies to print out. I've decoupaged all my pieces and added some diamond stickles to the dots on the ribbon and some glossy accents to the drops on the icing. The 3 is also from the Candy Doodles CD as you get a full alphabet and numbers on it. To finish off I added a happy birthday ticket with a sheer bow. Nelly - To celebrate Polka doodles 3rd Birthday I just knew what ever I made needed 3 candles on it! 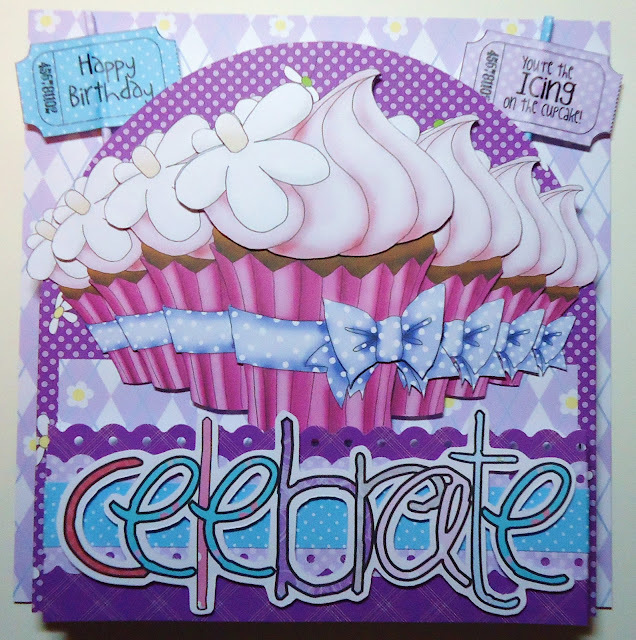 so here we have an easel "Birthday Cake" card , looks good enough to eat doesnt it! the papers are taken from the Stamp and Circle magazine cd's and the image is from Pretty Sweet CD. Fliss - I decided on a floral element for my card and used the gorgeous roses together with papers from the Sugarplum Daisy CD. The roses are printed on watercolour paper and coloured with Aquamarkers before cutting out. I layered and tore the papers and stamped 3 corners of the green backing paper with my fave stamp from the Daisy Doodles stamp set, embossing in white. 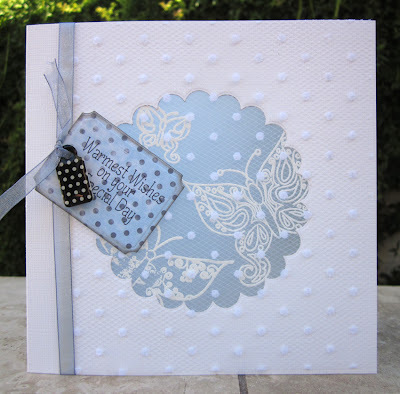 I die cut some circular doilies with a Marianne Design set and added dry embossing and punching for texture. Happy Birthday Polka Doodles! NJ Happy 3rd Birthday Polkadoodles, for my card I used the Pretty Sweet CD. The character I have used is so cute. 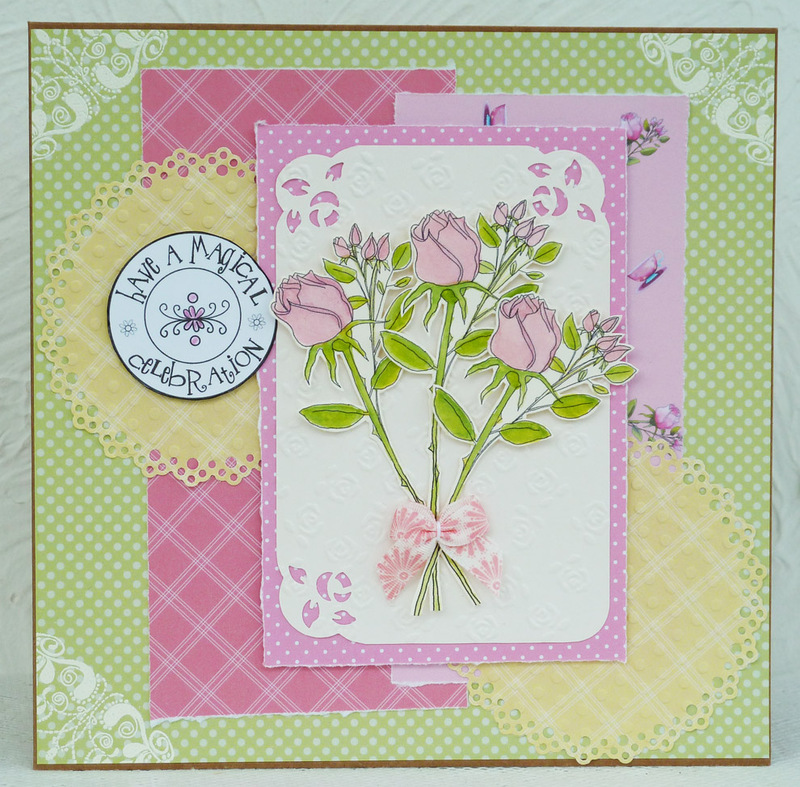 I have used the Marianne Design Flowers Die LR0131. I used 3 of everything,papers, flowers, pins, lace and beads. Claire A very special celebration indeed! 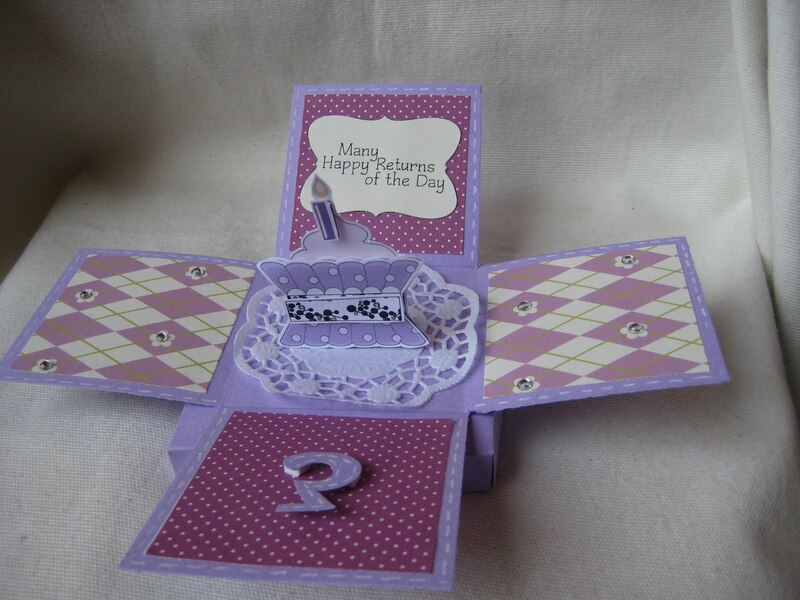 I have used 3 dp's(Candy Doodles collectors edition), 3 ribbons(Candy Doodles collectors edition), 3 flowers (Double Sprinkle of Kraft), 3 images(Sugarplum daisy cd) and of course the number 3(Sugarplum daisy cd) for our special 3rd birthday card. Oh my it just so happens I used 3 cd's as well! JAN: I chose three yummy cupcakes for my card to celebrate Polkadoodles 3rd birthday. 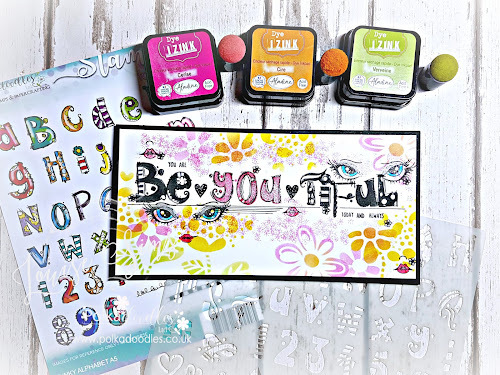 I used the cupcake stamp and stamped once onto card and twice onto shrink plastic - the large one is coloured with Promarkers and the two small ones are coloured with pencils, before I shrank them. The pretty flowered paper is from the 'Sugar Birdies' CD and the pink striped paper is from the 'Candy Doodles' CD, as is the sentiment. Almost good enough to eat! Lisa: 'The Crafting Owl. Happy Birthday Polkadoodles!! For my card I decided to use the presents and papers from Sundae of Seasons. I added glitter glue and wire to add more texture and interest. Miria To celebrate our 3rd blogversary I made an explosion box, the 3d cupcake is from cd All Around and Everywhere, papers and sentiment from Sugarplum Daisy , just added some gems and a doily from stash. Join in our celebration now! Claire (Happy Days) - Happy Birthday to us!!! What celebration wouldn't be complete without a bit of cake?? 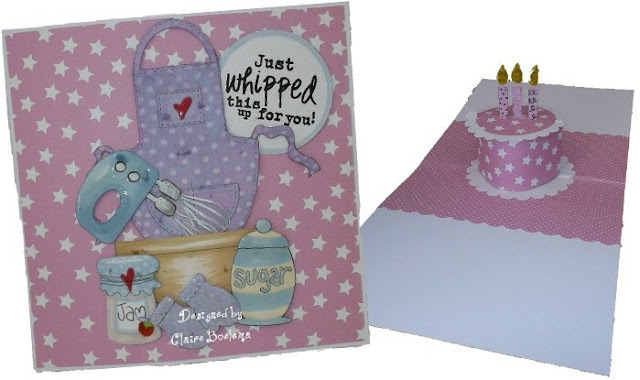 So for my card I used the the Sundae of Seasons and Sugarplum Daisy to whip up a very special pop up cake with three candles! It's a huge card (well for me anyway) and I struggled to picture it, so please forgive the photos. However, the good news is it folds flat for posting!!! 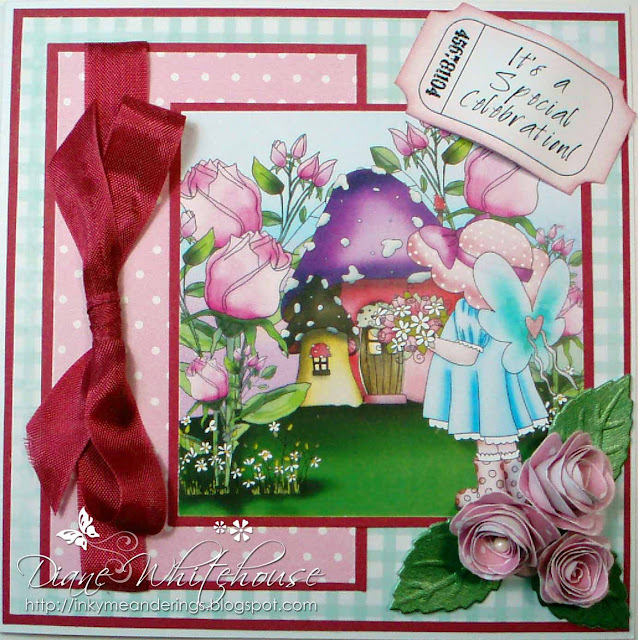 Diane... for this Special Celebration I’ve brought together the wonderful Sugarplum Daisy CD and a Marianne Creatables die to create the rolled roses and the leaves. Shell...I have made a 8x8 card for the special 3rd Birthday challenge...The image is from the candy doodles collectors edition cd and has been coloured with copics. 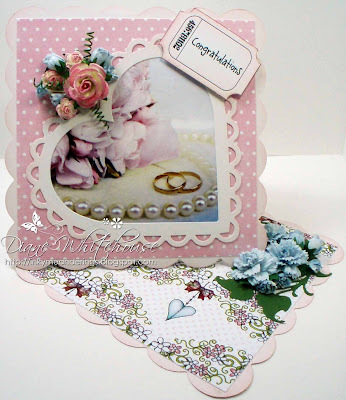 The papers and tag sentiments are from sugarplum daisy cd...Flowers, gauze and pearls are from my stash. Nikky...I decided to keep my card really simple this week. I used the cupcake digi from Sugarplum Daisy and the lovely star papers which I adore. I think my 3 buttons have moved on this card! 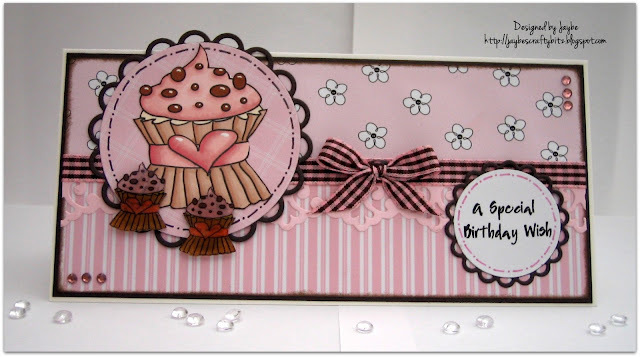 Dee...I've used the cupcakes, papers, tickets and alphabet letters from the CD Sugarplum Daisy. I printed the tickets onto Letraset Safmat then applied to printed card and cut out. Each layer is set forward 1 cm to give extra depth, but it all folds down flat to fit into an envelope nicely. Lou: I have been very privileged to be with Nikky for the 3 years and she has made things a "blast" to say the least and agree with En and Ruth .... time flies when you are having fun! All papers and elements are from Sugar Plum Daisy CD. The alphabet was printed on to Safmat to make my sentient. My 3 things are my presents and flowers. Daniele: I've also used the bear from Paper Boutique Vol 3 plus quite a bit of sparkle! 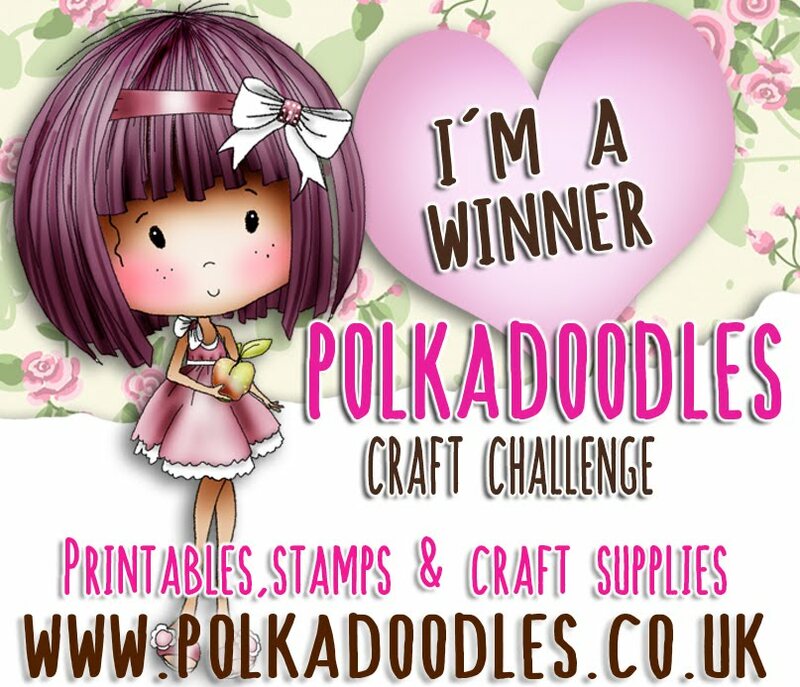 Hi everyone, challenge time again for us here at Polkadoodles! It's Lou's turn to host the challenge this week and it's a goodie! 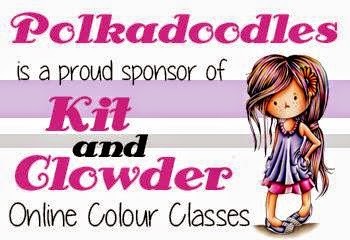 Before we go on further - we have some very exciting news coming up on Tues 22nd May which will be Polkadoodles 3rd Birthday! We're having a BIG celebration and chances to win over £220 worth of blog candy - so make sure you come and join us at our special party on TUESDAY 22nd to be in with a chance to get some wonderful candy! woooohoooo!! 1st place - Claire C, 2nd place - Cathy Lee, 3rd place - Fiona. Congratulations! please email Nikky for your prize and grab your blinkies from the sidebar - the first placed winner receives a FREE download! Please put in the subject field of your email your placing and the challenge number. Hi, Lou here and it's my week to set the challenge and I wanted to make this weeks theme a challenge! I would like everyone to make a wedding card but with a twist. You all know the famous wedding quote of "something old, something new, something borrowed and something blue"..... so ...... I would like you to make a wedding card incorporating all these elements. I did say it was going to be a challenge !! Lou: My wedding card has been made using loads of elements from the Love and Cherish Cd and made to look a little "shabby chic". My something new is the gorgeous Marianne Design pom pom ribbon; my something old is a neglected decorative corner punch; my something borrowed is the gold rings charm which was borrowed from a friend and finally my something blue is the 2 hearts with lickle blue gems. Nelly My wedding card with a difference is a shaped easel card created using dies, something old is the cream satin ribbon, something new was the the Bride & Groom stamp coloured with pro markers , something borrowed was the heart border punch from a friend and something Blue is the colouring behind the rose arch which was taken form Pretty Tuff CD, the design papers were taken from the Wonderland CD, the birdcage i resized the birdcage template from Paper Boutique 3 CD, sentiment is from the Love and Cherish Cd. the Anja corner (bottom right) is from Marianne Design; LR0215. Claire - I made an exploding box for my wedding card. The something old is the box, it's an old technique which I've used loads of times. The something new is the owls wedding clothes - I used the owls from Sugar Birdies Collectors Edition and simply drew a jacket and a top hat for the groom and added a veil for the bride. I had to borrow a mini heart punch from a friend and obviously the something blue is the papers which were printed from the Candy Doodles Collectors Edition. The large button hearts were taken from a Sundae of Seasons and I drew the horse shoe. Jan: My wedding card is a traditional easel card - the paper and sentiment are both from the 'All Around & Everywhere' CD. 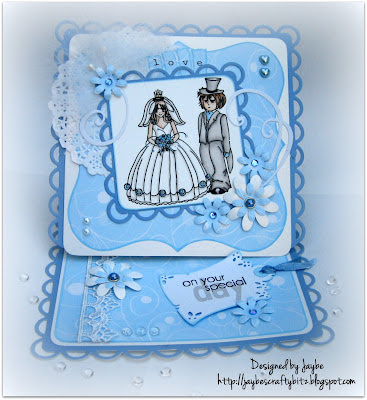 My something old is the piece of ribbon on the sentiment tag (which was cut from an old pair of pyjamas); something new is the cute little Bride and Groom stamp which is coloured with Promarkers; something borrowed is the gorgeous white feather tucked behind the image (from my daughter's stash) and something blue is the colour scheme. Norine: My card this week uses Polka Doodles Flutter Fairy rubber stamps on vellum and heat embossed. I adhered the vellum behind the scalloped window opening and layered blue dot paper (Pretty Tuff cd) on the inside of the card. Then I layered swiss dot tulle over the whole front of the card, and adorned it with ribbon and the sentiment tag which is printed on Pretty Tuff paper. Sentiment from the Candy Doodles Collectors cd. The little black tag charm is something (very) old, the sentiment digi is new, the white emboss on vellum is a technique I borrowed (lifted) from a sample I saw at CHA this year, and the paper is blue! NJ I chose to make a Wedding Anniversary Card, as my husband and I celebrated our 17th Wedding Anniversary in May. I have used the Love & Cherish CD. My something borrowed is the photo from my wedding album, which is also my something old. My something blue is the vintage lace I have used from Marianne Design . My something new are the embellishments I have used. I made a pocket too on the card to keep the photo in, and then you can just lift it out to look at. 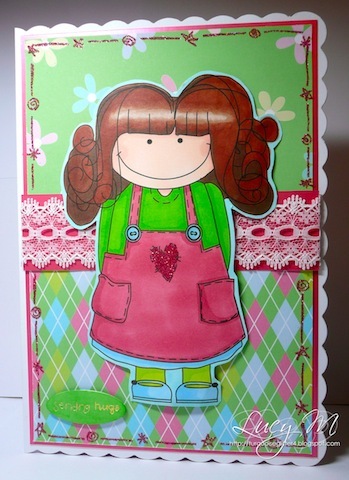 Shary - for my card this week I've chose a Candy Doodles image and coloured it in with Copics. The "blue" and white backing papers are from the Sugar Birdies CD and I've gone around the edges with a little blue ink. The heart paper which I've given a decorative border with a "new" Martha Stewart punch is from the Candy Doodles CD. I've added some white ribbon and some heart gems which I've had for ages , hence the "old". The sentiment ticket is also from the Candy Doodles CD. And for the "borrowed" I was on borrowed time as I was supposed to be doing housework!!! Claire - I decided to make a gift card and a confetti box this week. Using the Love and Cherish cd to print onto Safmat I have decorated a clear plastic box from some moisturiser (something old), filled my box with some Frantage Shaved iced (something new and something borrowed - don't have confetti)....something blue - well there's some little blue hearts on the paper. Shell- Something a little different from me this week (no colouring eekk), I have used 1 image off each of the pretty tuff and pretty sweet cd's, the flowers were punched from papers from pretty tuff...Something old is my embossing folder, something new is my new flower punch, something borrowed is the sentiment and something new is the flowers..
Patty...for my Wedding card I used Green Dot Paper and Boy & Girl Owls from the Sugar Birdies CD, I needed to add something blue which is the blue at the front with the knot, something old - the edges. 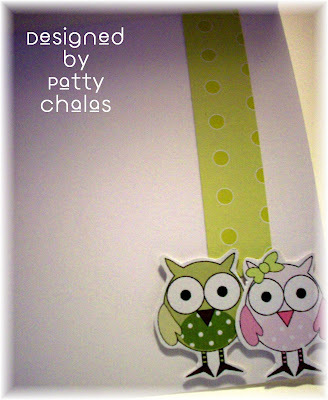 You can see how I made this on my blog. Diane -I think I've only ever made one wedding card before so this is something of a departure from the norm for me! 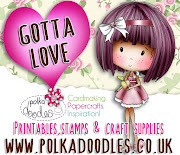 Anyhoo, Love and Cherish CD to the rescue together with some lovely papers from a couple of other Polka Doodles CDs and job done! I hope you like it! So there's your inspiration - some fantastic projects from the DT this week I think you'll agree! You have until Sun 27th May at 12 noon GMT to enter the challenge, so just add your URL to the Linky below! Good Luck! Woohoo it's Polkadoodles Friday again! We have a great challenge for you all this week but a little heads up with some other news! 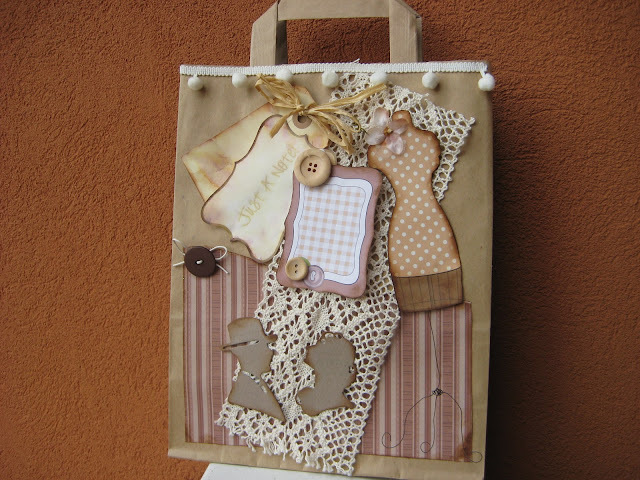 Firstly, you can catch Nikky on Create & Craft for a full 4 days next week - oh my, they're keeping her busy busy! She will be on air at 8am, 1pm & 4pm Monday 14th May, 9 &2 on Tues, 2 & & on Wed and 8,11 & 5 on Thursday (subject to change of course!). She can't reveal what she's doing yet but let's just say there will be lots of colouring and tips and techniques involved so I hope you can all tune in and email in - it would be super to get all of the bloggers mentioned on the shows! Also, we have a rather special birthday coming up this month so make sure you do check in on us next week when all will be revealed and we have something spesh up our sleeves! Before we get onto this week's challenge let's find out the winners from the Week 17 challenge Shabby Chic/Vintage which gave us all a very difficult task with so many gorgeous entries. Congratulations! please email Nikky for your prize and grab your blinkies from the sidebar of the blog - the first placed winner receives a Pretty Sweet CD, woohoo!! Please put in the subject field of your email your placing and the challenge number. So now on to this weeks challenge with the theme of Monochromatic Shades. The hardest part will be choosing which colour to go for and read on for some fabulous inspiration from the Design Team who have all excelled themselves with a gorgeous array of projects to feast your eyes on! You have to choose just ONE single colour for your project, but you can choose as many shades of that colour as you wish. The winner of this challenge will receive a Download Bundle choc full of goodies! Emma. Hello there, here I am hi-jacking a week that I am not supposed to once again - Oh well, the challenge was just too enticing this week to miss. I have chosen the colour brown for my monochromatic look this week and all the elements came from the Sugar Plum Daisy CDROM. The colouring was Brushed Corduroy Distress Ink. Embellies are Marianne Design Creatables and Doodle Dewdrops. 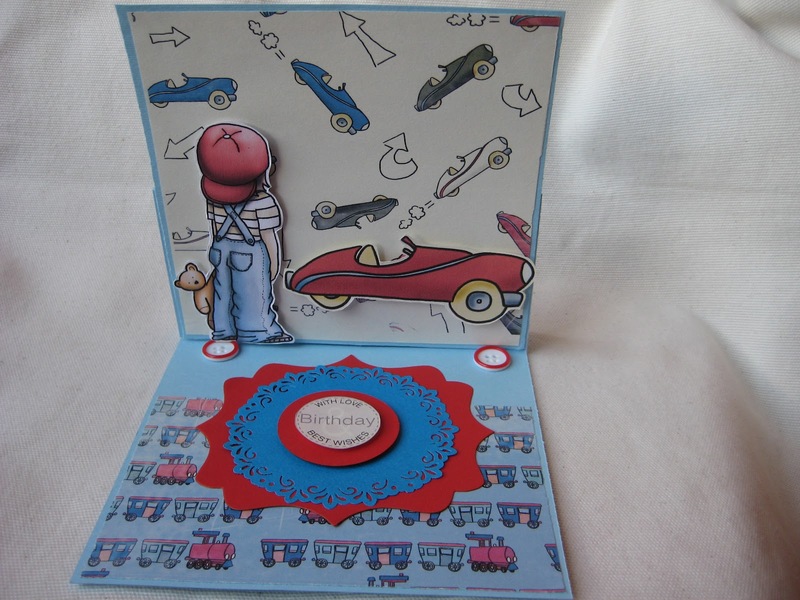 Lucy: This week I used the backing papers from the Sugarplum Daisy CD Rom and the image is from the Candy Doodles CD Rom. The image and butterfly were coloured in using a mixture of Pro Markers and FlexMarkers. 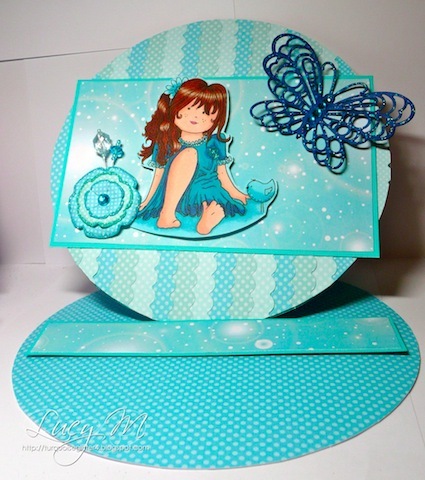 The butterfly and flower were made using Marianne Design Creatables. Enfys: I can never resist this baby from the Sundae of Seasons CD, matching paper from the CD as well. 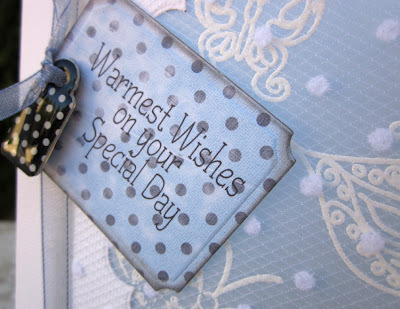 I coloured white chipboard letters with blue to match, the whole thing is so soft and pretty, just like a new baby! Lisa - The Crafting Owl. For the challenge this week I decided to think pink and have used the Miss Twoo template from Paper Boutique and papers from Sundae of Seasons to make a card. I've been wanted to have a go at this template for ages and this was the perfect opportunity. 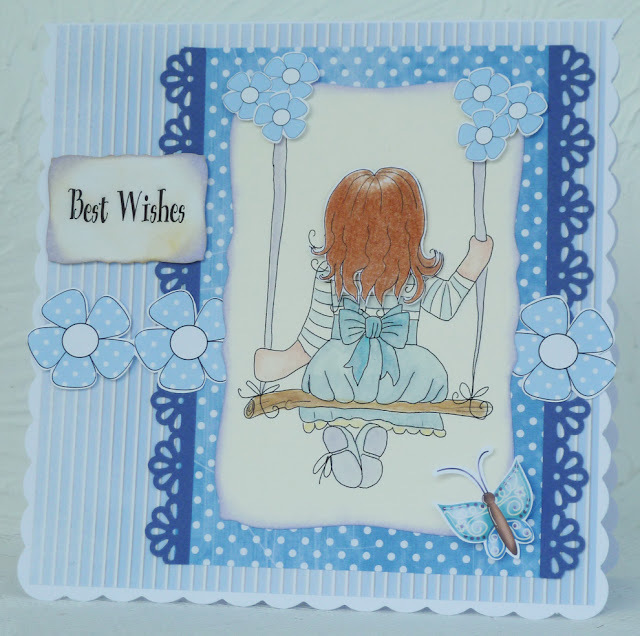 Fliss - I've gone for blue for my card using a pretty image from the Pretty Sweet CD printed on thick cartridge paper and coloured with Aquamarkers. The papers are from the Pretty Tuff CD and the flowers from the Sugar Birdies Collectors Edition. The butterfly is from Sundae of Seasons and all I added was some punching with a Martha Stewart border punch. 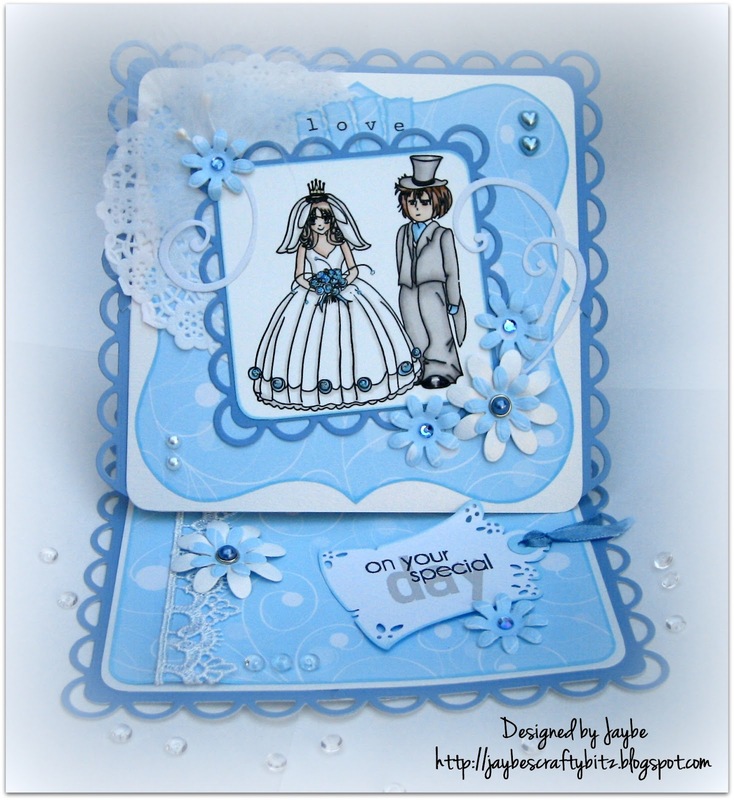 Hi Daniele here, for my card this week I used images from the Love and Cherish CD, so many elegant designs perfect for weddings and anniversaries. Anne - The papers are from the new Sugar Plum Daisy CD , the banner and image are from Not for Girls CD. Coloured with prisma pencils which I blended with mineral spirits and as it's CAS I only added a few little dew drops to embellish. Miria - To decorate my paper bag I used an image from cd Sundae of Seasons, I paper pieced and distressed it, the papers and sentiment are from the same cd. The die-cuts are Marianne design Creatables. Buttons, lace and pompom trim from stash. Diane - The wonderful Sugar Plum Daisy CD has been the source of most of the items on my card. The image has been coloured with Copics and Wink of Stella pens. Ruth - How could I resist and not make a Christmas card?! Papers are from Sundae of Seasons and I've distressed the edges with a pair of scissors. I've used two Marianne Creatables dies - the snowflakes (LR0125) which I have cut from vellum, and also the hanging icicles (LR0135). Two half pearls and some liquid pearls for detail and the card is complete! So there's your inspiration - some fantastic projects from the DT this week I think you'll agree! You have until Sunday 20 May at 12 noon GMT to enter the challenge, so just add your URL to the Linky below! Good Luck!